Ever since the launch of LibreOffice in late 2010, slimming and trimming the unwieldy and aging code base it inherited from OpenOffice.org has been a priority for the Document Foundation. “One of the unfortunate things that LibreOffice inherited, as part of the several decades worth of unpaid technical debt, is unused code that has been left lying around indefinitely,” wrote Michael Meeks, a Linux desktop architect at SUSE who coordinates LibreOffice development work, in a blog post on Monday. In general, unused code tends to bog down any piece of software, causing it to perform more slowly than it should. Now, however--more than a year since the OpenOffice.org fork was born--there's concrete evidence of the progress developers have made. Following a recent analysis, in fact, “it seems that over half of our unused code has now bitten the dust,” Meeks wrote. 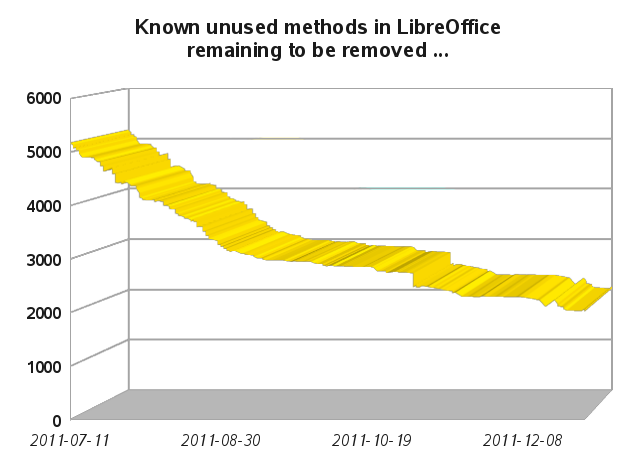 Accompanying his post was the graph below illustrating the drop in the number of unused methods in the software. Of course, removing waste tends to reveal more material that needs to be removed, resulting in some of the smaller spikes in the graph, Meeks pointed out. Nevertheless, the problem is clearly on a downward trend. That, in turn, means we can all look forward to a leaner, meaner LibreOffice in the coming months. The latest stable release of the free and open source office productivity suite is version 3.4.4, which was released in November; it's currently available for download from the LibreOffice site. Version 3.5--packed with “a large number of interesting new features and performance improvements,” according to a recent post on the project's blog--will be announced in early February. A public bug-hunting session was held for that release in late December, resulting in the identification of more than 70 bugs, the Document Foundation reports. The next bug-hunting session for the release will take place on Jan. 20 and 21. Also currently in the works is an online version of LibreOffice, as Charles Schulz, a member of the Document Foundation's steering committee, recently pointed out. Meanwhile, the Apache OpenOffice project is targeting a first-quarter 2012 release for version 3.4 of its competing office suite--even as Germany-based Team OpenOffice.org works on its own “White Label Office 3.3.1."